Recent returns from the BTO include 2 Goldfinch ringed on the Calf of Man. is located in North Somerset just north of the Mendip hills on the southwest shore of Chew Valley Lake and on the A368 road midway between Bath and Weston-super-Mare, between the villages of Bishop Sutton and West Harptree. Ringing started at Chew Valley Lake in 1963 and the first report was produced by the Mendip Ringing Group covering the years 1962-63. Our ringing area is mainly reed bed with some scrub. Between April and September we normally catch good numbers of Reed Warblers and Sedge Warblers and a varying number of other species such as Blackcap, Chiffchaff and Willow Warbler plus the normal residents which now include Cetti's Warbler. We get a good passage of migrants and there is plenty of chance to see stages of moult. We also attempt to catch hirundines at roost. If you wish to enquire about membership or have any other query please email us at cvrsringing@fsmail.net in the first instance for details. 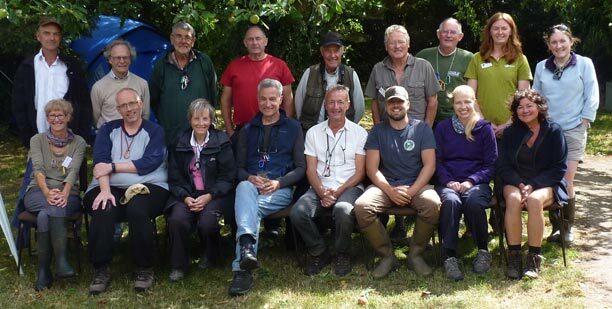 This year's ringing course ran over four days 26-29th July 2018. For the first time there were eight participants and the course followed a new format, with four tutors dedicated to supervise two participants each, leading to assessments at the end. Another change was to focus on quality of supervision rather than quantity of birds ringed. Post-course responses reflect that these changes were greatly beneficial to the success of the course. One participant received positive assessment for a training endorsement, two for advancement to 'A' permit and the others all made positive progress towards 'C' permit sooner or later. After the long heatwave the weather chose to close in, with wind and rain on the Saturday – not entirely a bad thing as this provided the opportunity to demonstrate how to monitor the worsening weather and close/furl nets when necessary. Indoor talks on bird handling and the moult cycle were well-received and are now a regular feature of the course. The preceding weeks of dry weather had reduced the normal abundance of birds in the catching areas. Totals were as follows: ringed 309; retraps 99; total caught/processed 408 of 26 species. The Thursday night hirundine roost catch comprised 63 Swallows and 13 Sand Martins. One adult Swallow had been ringed as a pullus a few miles away at Stowey. Only one Water Rail was caught – this may have been as a result of the plethora of tiny frogs that had just emerged and doubtless distracted adult Water Rails for breakfast, lunch and dinner. Other highlights included a retrapped 10 year-old Reed Warbler and opportunities to fit less-common ring-sizes required for a Canada Goose, three Mallard and a Kingfisher. Still waiting for the first Sedge or Reed Warbler of the year. First bit of ringing for a while was a tad quiet, though 2 new Chiffchaff is always a good thing.